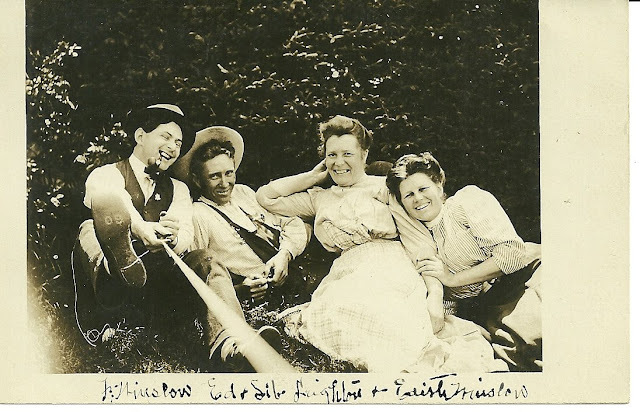 Circa 1910 Real Photo Postcard of two couples from Cherryfield, Maine: Frank and Edith (Tracy) Winslow and Edgar and Sybil (Wilson) Leighton. What do you think Frank Winslow is pulling? Something attached to the shutter? 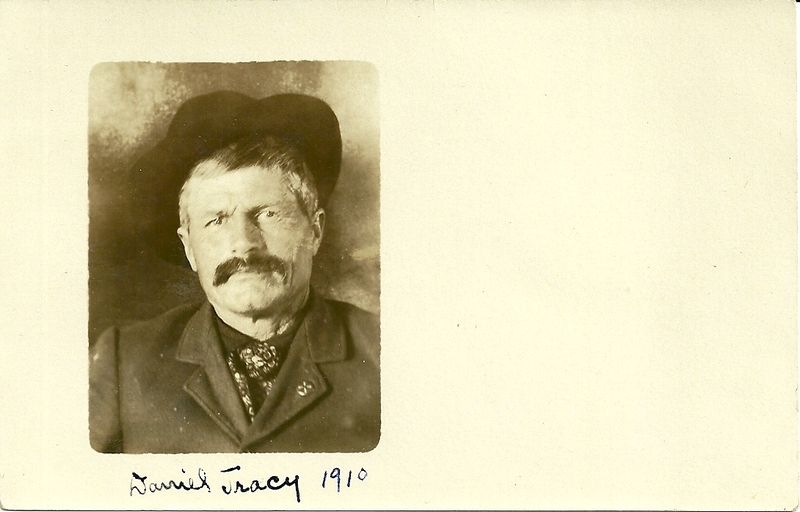 I'm guessing the 1910 date because this postcard was found with another one of Edith's father, Daniel Tracy, that was dated 1910. (See a previous post about Daniel Tracy). Note that Tracy is often spelled Tracey, within siblings of the same family. The Maine Marriages database shows an Edith E. Tracey of Cherryfield who married Frank H. Winslow of Rockland on 22 Aug 1901. The next record I could find of Edith, the 1930 Census, shows her living in the household of Albert Tracy. The Maine Marriages database shows that an Edith E. Winslow and Alford L. Tracy married on 17 Jun 1930. What had happened to Frank, I do not know. At least we have this photograph, a reminder of happier times. As to Frank H. Winslow's background, he was enumerated on the 1880 Census of Rockland, Maine, living in the household of his grandmother Elmira or Almira Winslow and her sons Henry and Ezekiel and daughter Mary. Whether any of these three is Frank's parent, I don't know. It's possible that Mary could have been Elmira's stepdaughter. Hopefully a reader will solve the mystery. Frank's wife Edith E. Tracy was the daughter of Daniel and Julia (Higgins, or perhaps the surname of a previous husband) Tracy. Daniel was born in Cherryfield in 1853. Some sources point to an 1850 birth year in Cooper, Maine, for Julia. One source names Julia's father as Nathan Cooper. Edgar D. Leighton was born in March 1870 in Maine, the son of Truman W. and Sarah Eliza Leighton. I don't have information on Truman and Sarah Eliza's parents; the 1860 Census may point to Truman's father as Daniel; his mother or stepmother may have been Abbie. Edgar's wife Sybil Wilson ties in with the Tracy family. She was born in Maine in Cherryfield about 1875, the daughter of George W. and Laura (Tracy) Wilson. Sybil's mother Laura (Tracy) Wilson and Edith's father Daniel Tracy were siblings, the offspring of Eli S. and Diadama (Smith) Tracy. If you have information to share on the Winslow, Tracy/Tracey, Higgins, Leighton and Wilson families, I would very much appreciate hearing from you. My gosh, you're right on both counts! I love the photo - looks as though everyone's having a good time. Thanks for taking the time to comment - much appreciated.